The stone castle where Richard the Lionheart was imprisoned in 1192 overlooks the picturesque town of Dürnstein, Austria. By Mary Ann DeSantis | Photography courtesy of Tony & Mary Ann DeSantis. Aerial shots of the ship on the Danube were provided by Viking Cruises. River cruising along Europe’s waterways has become one of the most popular vacation choices for Americans. You can see many top destinations without changing hotels every night, but there are some things you need to know before you go. Jean and Evan Fleming of Fort Smith, Arkansas, are veterans when it comes to cruising along Europe’s famed rivers. They have completed three Viking River Cruises along Europe’s most picturesque waterways and are planning a fourth. The couple is among the 500,000 U.S. and Canadian residents expected to take a European river cruise in 2019, according to the Cruise Lines International Association. River cruise ships are indeed much smaller than ocean liners. You won’t find the same amenities, like several restaurant options each night or big Las Vegas-type shows. Yet small has distinct advantages: You’ll have the chance to meet and get to know fellow cruisers, and the staff, too. You’ll likely be sailing with less than 200 people onboard, and the staff will know your name whenever you walk in the dining room or stop by the front desk. Viking longships usually dock in the heart of the cities so that guests can walk right off the boat and sightsee as much as they want and return to their rooms when they want. Indeed, those were the reasons my husband and I were delighted to take our first Viking cruise along Europe’s Danube River last summer. An added benefit was getting to know the Flemings, who shared the tricks they’ve learned to make voyages rewarding and comfortable. Aside from checking weather forecasts in your ports of call, you will also want to exchange a little money before leaving home. While most of your river cruise expenses will be covered, you will still need local currencies – usually Euros – for your personal souvenirs and for meals or snacks you decide to eat in town. After all, you don’t want to skip a chocolate torte and a Viennese coffee in Austria or a sausage in Budapest, Hungary – both premier destinations on the Danube River. The route along the upper Danube includes everything travelers to Europe hope to see: historic buildings and landmarks, majestic castles, UNESCO World Heritage sites, and scenic panorama views. See the sidebar story for a list of my favorites. River cruising offers travelers opportunities to explore the heart of multiple destinations in some of the world’s top destinations. It’s the ultimate view into culture and history, and at the end of the day cruisers relax in luxury with exquisite meals and impeccable service – where everyone knows your name. • Arrive at your ship’s departure city at least a day or two in advance. You’ll be glad to have the time to get over jet lag and not have to worry about unexpected flight delays. • Don’t rely solely on credit cards. Surprisingly, many restaurants and even a few museums in Eastern Europe did not take credit cards. The restaurants and shops that did accept credit cards insisted on a minimum level of spending. • Reserve popular excursions before you go, but leave some time to explore on your own. 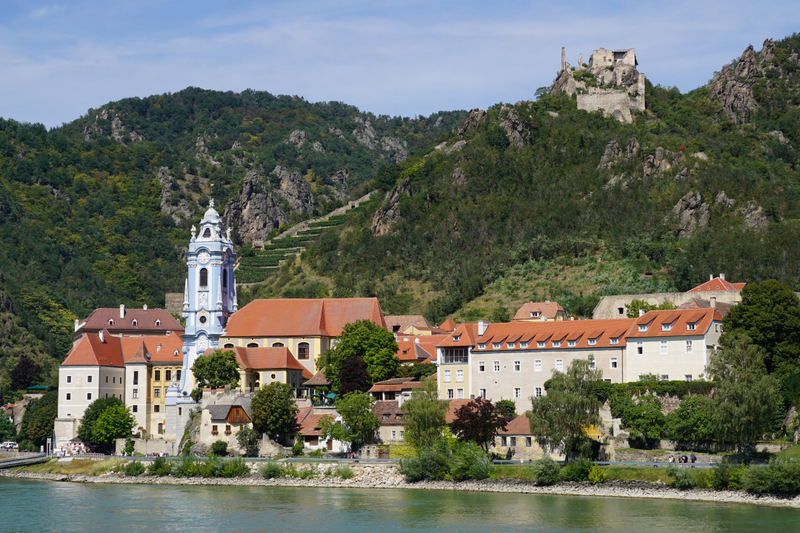 Viking River Cruises also offers guests a chance to book excursions once on board. • Do attend the ship’s lectures and briefings each evening. You’ll learn valuable information about the next day’s destination and about any itinerary changes. • Take more than one pair of walking shoes. I found it very comforting to switch shoes each day, sometimes more than once a day. For the cobblestone streets, a sturdy pair was perfect, but my feet needed a breather especially in the evenings. I packed three pairs, including Earth Origins walking sandals in the summer. If a winter cruise is in your plans, you may want to take lightweight boots. • The month of August is not an ideal time to go. Crowds in the major cities are overwhelming, the heat can be intense, and river water levels drop, sometimes forcing river cruises to adjust the itineraries. Prices, however, are often lower than peak periods. Carved into the hills of the Castle District, this maze of caves served as a secret hospital during World War II and during the 1956 Hungarian uprising. The one-hour tour leads visitors through rooms that still contain original medical equipment. This small, but extremely poignant monument honors the approximately 20,000 Jewish victims who were brutally shot along the banks of the Danube River in 1944-45 and whose bodies fell into the water below. While in the area, be sure to tour the inside of the iconic Parliament building. Discovering Slovak wines was a surprising (and pleasant) experience. Wine Not! in the old town square has the largest selection of Slovak wines, including the delicious Alibernet. Grab an outdoor table and people watch. This museum and town were unexpected treasures when our ship was rerouted because of the Danube’s extremely low levels of water. The town center was a great place to have an ice cream and listen to a local street musician. Books have been written about the Viennese café culture, and it’s a “thing” to while away an afternoon. The secret is finding a café that is not overrun with tourists. We decided to head down Dorotheergasse, a side street off the crowded – and expensive – shopping district of Am Graben. Open since 1945, Café Leopold Hawelka has been operated by three generations of the same family. Only later did I learn the café had been a meeting place for Cold War spies, writers, painters, and actors, including Peter Ustinov and Andy Warhol. The over 900-year old abbey (founded 1083) is not really off-the-beaten path for tourists, but it’s worth an afternoon of exploration to see the art and learn how today’s Benedictine monks are making a difference. Be sure to taste the Wachauer Marille, a special Apricot jam made only at the abbey. The former royal residence of the imperial Hapsburg family is an amazing walk through history, but be sure to leave time to walk through the spectacular gardens. The palace has an admission fee, but the gardens are free to explore.